Claude Arpi salutes 50 years of Auroville, a Grand Experiment in Living. Old timers will remember the famous journalist and editor Russi Karanjia who founded Blitz, a national weekly. Started as early as 1941, India's first tabloid focused on investigative journalism and 'hot' news; sometime the frontier between 'investigative journalism' and fake news was tenuous. Sometime at the end of the 1970s, Blitz published a double-page article entitled 'Auroville, the Snake Pit. It was full of 'news' about the bunch of forengi hippies living near Pondicherry (now Puducherry). The reporter (I don't remember his name) spoke of drug addicts and peddlers who were trying to create a new sect, in the form of a city with Vatican-like status. It was the worst place on earth. All of it was obviously absolute fake news. Those of us who lived in rather rustic conditions on the arid plateau were understandably, deeply, upset, but we soon decided to continue doing our work and did not even contact the editor to make a fuss about the article. On Sunday, February 25, the prime minister of India arrived on the now afforested plateau to celebrate the golden jubilee of the project, the Blitz title flashed in my mind. The times had certainly changed. Speaking in the Bharat Nivas auditorium, Narendra Modi declared: "Sri Aurobindo's vision of India's spiritual leadership continues to inspire us even today." "Indeed, Auroville is a manifestation of that vision. 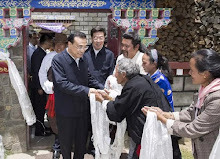 Over the last five decades, it has emerged as a hub of social, cultural, educational, economic and spiritual innovation." The prime minister described Sri Aurobindo, the Rishi of modern times, as "A man of action, a philosopher, a poet, there were so many facets to his character. 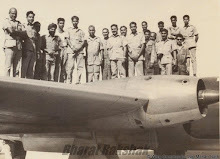 And each of them was dedicated to the good of the nation and humanity." 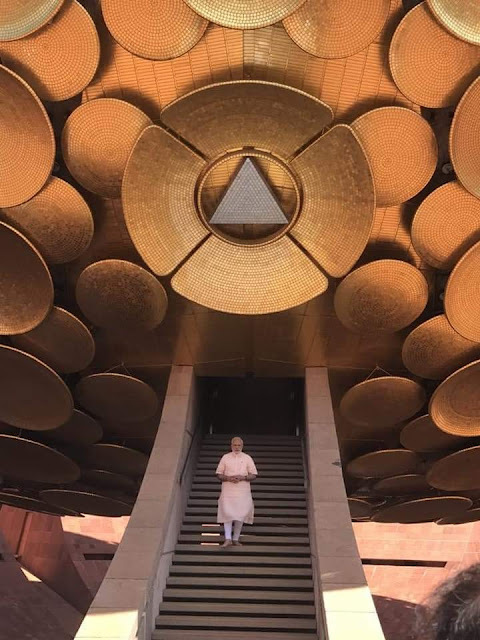 He spoke of the five high principles for Auroville, beginning: "Auroville belongs to all humanity, a reflection of India's ancient credo of Vasudhaiva Kutumbakam -- the world is one family." "The very fact that Auroville has brought together such a huge diversity of people and ideas makes dialogue and debate natural," Mr Modi continued. "Auroville showcases the ancient Indian tradition to the world by bringing together global diversity." He spoke of a "Yagna" for unity performed 50 years ago: "Men and Women brought soil from all parts of the world. In the mixing of the soil began the journey of one-ness." On February 28, 1968, some 5,000 people gathered on a barren plateau of red laterite, north of the former French establishment in Pondicherry. That day marked the birth of a 'Dream' which had rarely been attempted; to bring people from different countries, races, religions, backgrounds in one single place to build a city together, 'a Tower of Babel in reverse', in the Founder's words. Perhaps the most astonishing part is that the 'dream' still exists; and nobody today thinks to call it a 'snake pit'. 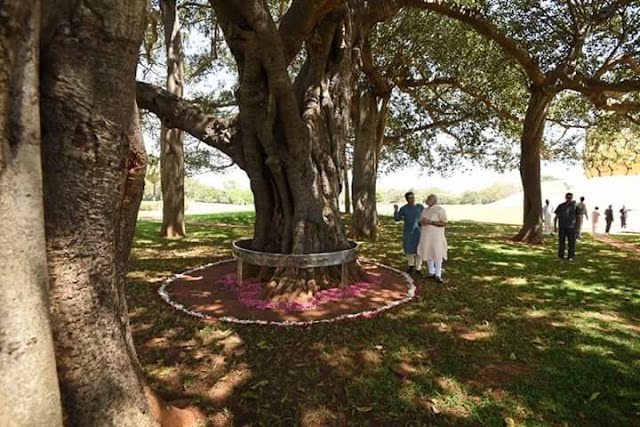 On the contrary, the prime minister prayed, "May Auroville serve as a beacon to the world. May it be the guardian which calls for breaking down narrow walls of the mind. May it continue to invite everyone to celebrate the possibilities of humanity's one-ness." What a journey it has been. Not always an easy one for the early settlers. In 1968, as the world was churning (it was three months before the May 1968 students revolution in Europe), the utopia of a universal city began to take shape. Instead of destroying 'an old world', the idea was to construct a 'new' one; it was undoubtedly far more difficult, because it meant building new men and women. Indeed, this apparently crazy 'lab' had all chances to explode under the pressure of human egos. The person who had this 'strange' utopian idea was the French-born Mother, Sri Aurobindo's collaborator, who had set up the Sri Aurobindo Ashram in 1926. 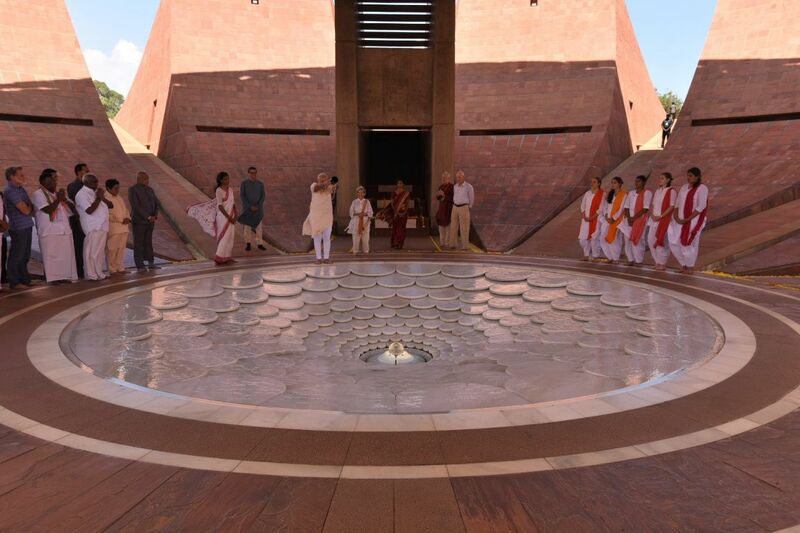 Young couples -- representing 124 countries and 23 Indian states -- placed a handful of soil from their respective countries or states in a lotus bud-shaped foundation urn at the centre of the future city. In the midst of this barren area, the banyan tree nearby would become the geographical centre of the city. The fact that it received the unanimous endorsement of the general assembly of UNESCO did not change the lives of the pioneers, who had to 'survive', often on millet, during the scorchingly hot summer of South India, living in rudimentary thatch huts. In many ways, life is today easier than during the first years of the City of Dawn. 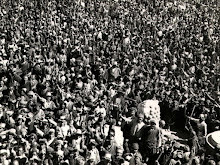 At first, only a couple of hundreds heard the call, to what the founder called a 'Great Adventure'. However, after the Mother passed away in November 1973, life changed drastically. The Aurovilians were then left to stand on their own feet, materially and spiritually. But they knew that they had to carry on the mission given to them by their mentor, to build the 'City the Earth Needs', a smart city before its time. 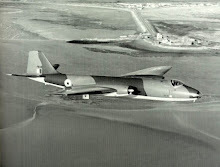 The task was immense, but the most immediate need was down-to-earth, to create shade from the scorching sun. Aurovilians started to rejuvenate the arid land. They planted trees, built bunds and dams to stop the soil being washed away with the cyclonic monsoon rains and constructed the first primitive houses. It is how the first pioneers became 'experts' in the environment, giving Auroville the reputed expertise it has today. 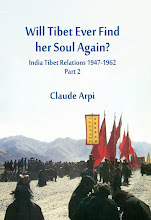 She had also said that in Auroville 'money would be no longer the Sovereign Lord, individual merit will have greater importance than the value due to material wealth and social position.' Money had nevertheless to be generated for the project to survive and develop. It is JRD Tata -- a great supporter of the concept of Auroville since its early days -- who thought that Auroville crafts could become Auroville's best ambassadors. In 1980, the Tata Group sponsored an exhibition Auroville Today which toured the major cities of India through the year. The exhibition was a tremendous success. Nobody could have guessed then that just over three decades later, Auroville would be visited by thousands of people every day. Auroville may not yet have succeeded in all its objectives, but the way of life chosen by the pioneers is today acknowledged by many, including the senior-most functionary of the Indian State. 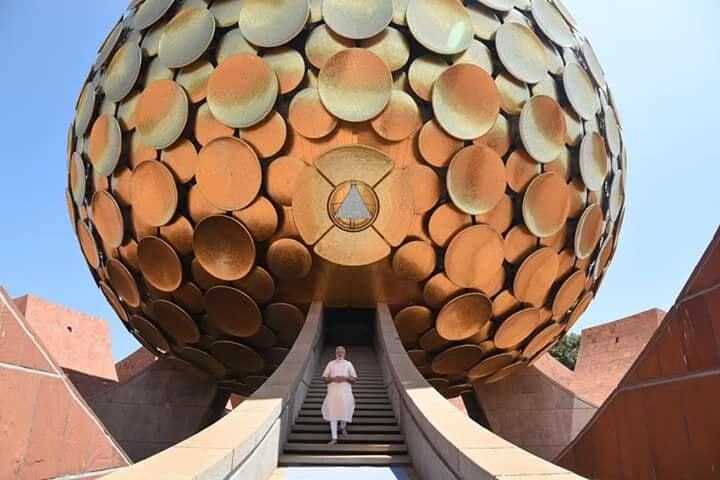 The fact that Mr Modi was accompanied by the governor of Tamil Nadu, the lieutenant governor of Puducherry, as well as the Union Territory's chief minister and other dignitaries, was a homage to Auroville's founders and to the settlers, old and young, who have made the Dream the beginning of a reality. For me, one of the best compliments Auroville received over the years came from an official at the Controller and Auditor General, which annually goes through Auroville's accounts. Having read too fast the Charter, he wrote in his report (later filed in Parliament), that Aurovilians are the 'living survivors of the Divine Consciousness'. 'Survivor' had replaced the original 'servitor'. An apt description indeed. Let us hope that Auroville continues to survive, and the 'survivors' remain true to the Dream. 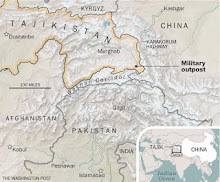 Tailpiece: I am grateful to Mr Karanjia for having given me my first chance as a journalist to write for Blitz on China affairs in the early 1990s. This is called the 'Irony of Life'!